October has a bit of a reputation in financial markets as being more prone to volatility than most months. While there are solid theories as to why (earnings, start of Federal fiscal year, seasonal staffing patterns among traders), there's no solid rhyme or reason as to how the volatility will play out. This time around, October was horrible for stocks and mixed for bonds/rates. 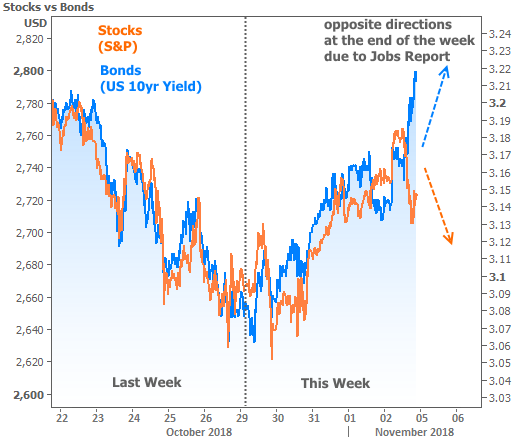 In general, most days saw stocks and rates move lower together, but that changed in a big way this week as markets transitioned into November. In stark contrast to last week, both sides of the market moved almost exclusively higher. The only exception was the divergent move seen after Friday's surprisingly strong jobs report. Strong economic data tends to help stocks and hurt bonds/rates. Why did it hurt stocks this time around? The short answer is that the jobs report was so good that it increased the odds of additional Fed rate hikes. And the stock market doesn't like rate hikes any more than the bond market! Investors are already counting on a few more rate hikes by the middle of next year. That means the current trajectory of Fed rate hikes is baked in to current trading levels. If something happens to change the trajectory, trading levels can change fairly quickly, and the jobs report was strong enough to do just that. What was so good about the jobs report? 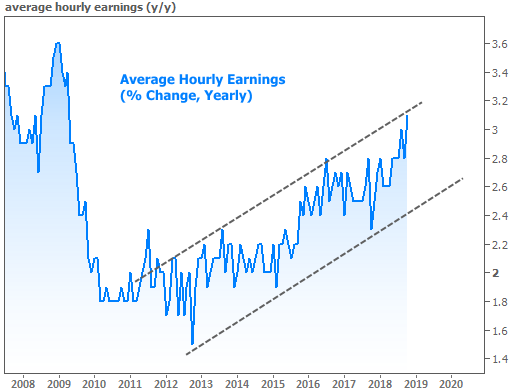 On a purely objective level, wage growth is the highest it's been since before the recession. Wages are seen as a key driver of inflation. The Fed is tasked with keeping inflation in check--something it does via rate hikes. Logically then, faster wage growth should steel the Fed's rate hike resolve. On a more subjective note (but with objective data to back it up), the pace of job growth has been surprisingly strong lately. 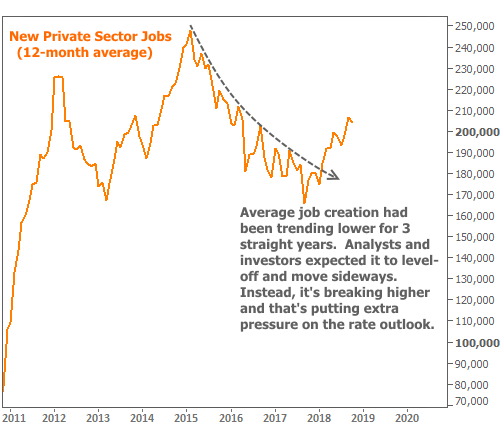 The following chart shows the 12-month average of new private sector jobs created. Based on past economic cycles, most investors were expecting to see job growth level-off and hold fairly flat for the next few years. Instead, job growth has broken higher in a way not normally seen at this phase of an economic cycle. That's forced traders to make increasingly abrupt adjustments as this weird new reality continues to assert itself month after month. 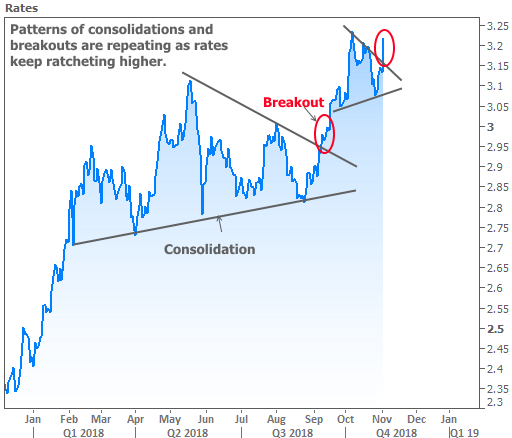 The fallout from such adjustments can be seen in another breakout for interest rates. The chart above shows 10yr Treasury yields--the most widely followed representation of "longer-term rates" in the US. Of course those of us with a stake in the housing market are generally more interested in mortgage rates. Unfortunately, the bonds that underlie mortgages don't cope with volatility as well as plain old US Treasuries. As such, mortgage rates have been underperforming. In fact, the week ended with average 30yr fixed rates at their highest levels in more than 7 years. This assertion is at odds with several mortgage rate headlines from well known publications, and that's normal. Those publications are relying on survey based data from Freddie Mac which is based primarily on rate quotes from the first 2-3 days of any given week. 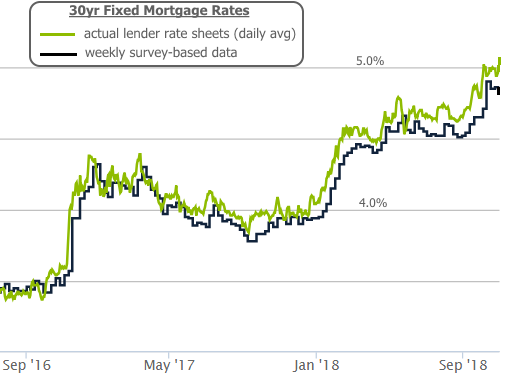 As such, if there is a big move in the 2nd half of the week, Freddie's survey might indicate rates moved one direction when they actually moved another.